When Murphy's Law is invoked at my place it arrives with the utmost severity. I can't remember the last time I had a hard disk failure on any computer I have owned. Before last Thursday, that is. While I was thinking about fixing that computer my network server died with, you guessed it, a hard disk failure. The good news is that only one of them required a new disk, followed by the installation of Windows XP, followed by installing and registering all the applications, followed by restoring the data (after the server was fixed, because it is the one with the backup device). I learnt some undocumented tricks about the Windows Recovery Console and I am indebted to Steve Gibson for more than I paid for SpinRite, but if I had my druthers I would prefer to have never heard of either of them. Being a few days late allows me to report that James Randi underwent a bypass operation late last week. I wish him well and I hope to see him back fighting nonsense as soon as possible. His family have asked for privacy, and have suggested that those who feel a need to help should consider donating blood at the local Red Cross or Community Blood Centre. Cards may be sent to Randi care of JREF, 201 SE 12 Street, Fort Lauderdale, FL 33316. The news media over the last few days has been filled with pictures and stories of crazed Muslims burning flags, buildings and other forms of other people's property. Death threats have been issued and terrible consequences have been predicted if trade between certain countries is not immediately halted. All of this madness is because someone has dared to print some pictures. The strange thing is that the pictures were actually printed last September, but apparently it takes four or five months for the worst offence in the history of religion to be noticed. The modern, secular society is rejected by some Muslims. 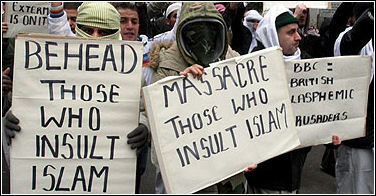 They demand a special position, insisting on special consideration of their own religious feelings. It is incompatible with contemporary democracy and freedom of speech, where you must be ready to put up with insults, mockery and ridicule. It is certainly not always equally attractive and nice to look at, and it does not mean that religious feelings should be made fun of at any price, but that is less important in this context. ... we are on our way to a slippery slope where no-one can tell how the self-censorship will end. 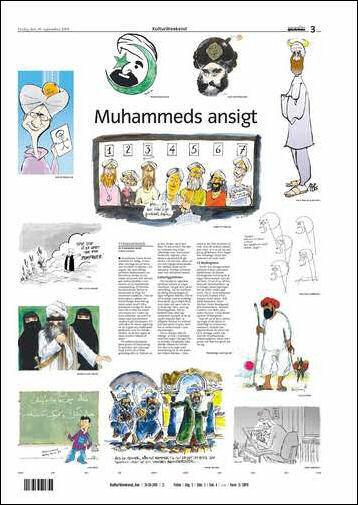 That is why Morgenavisen Jyllands-Posten has invited members of the Danish editorial cartoonists union to draw Mohammed as they see him. The face of Mohammed as a part of the Islamic star and crescent symbol. Mohammed with a bomb in his turban with a lit fuse. Mohammed with a halo in the shape of a crescent moon. An abstract drawing of crescent moons and Stars of David, and a poem on oppression of women "Profet! Med kuk og knald i låget som holder kvinder under åget!". In English the poem could be read as: "Prophet you crazy bloke! Keeping women under yoke"
Mohammed as a simple wanderer in the desert, at sunset. A nervous artist drawing Mohammed while looking over his shoulder. An Arab-looking boy in front of a blackboard, pointing to the Farsi writing, which translates into "The editorial team of Jyllands-Posten is a bunch of reactionary provocateurs". On his shirt is the word "Fremtiden" (the future). Another drawing shows an angry Mohammed with sword and a black bar censoring his eyes. He is flanked by two women in niqaabs, having only their wide open eyes visible. Mohammed standing on a cloud, greeting dead suicide bombers with "Stop Stop vi er løbet tør for Jomfruer!" ("Stop, stop, we have run out of virgins! "), an allusion to the promised reward to martyrs. Another shows journalist Kåre Bluitgen, wearing a turban with an orange dropping into it, with the inscription "Publicity stunt". In his hand is a child's stick drawing of Mohammed, referring to Bluitgen's upcoming illustrated children's book on the life of The Prophet. The proverb "an orange in the turban" is a Danish expression meaning "a stroke of luck", here the added publicity for the book. This whole thing is absurd and is a perfect illustration of how religion can cause people to lose touch with reality. There is nothing in the Qur'an which prohibits images, and, in any case, other religions have had to put up with much worse than this. Of the twelve cartoons, one is mildly funny (the "running out of virgins" one), some contain quite justified political comment (the bomb in the turban, the blind man and the seeing women, the poem, and the frightened cartoonist) and the rest don't say much at all. If a religion with hundreds of millions of followers is threatened by these pictures then it must be a very shaky structure indeed. What was it that that other prophet, Jesus, said about building on foundations of sand ...? As I said in the first paragraph - madness! Freedom of speech is a fundamental human right, and this freedom includes the right to offend other people. The overreaction indicates a child-like mentality in the protestors, where petulance and bullying replace rational discourse. I can understand why the Western media have been reluctant to reproduce the pictures because I have been subjected to the same type of infantile bullying over the last few months (although I am only at risk of losing my house, not my life), but principles are important. And it is irrelevant that some people are so besotted with religion and superstition that they don't understand these principles. A couple of youthful Baptists turned up at my door over the weekend, and we had an interesting discussion about how I am an atheist and will probably regret this when I find myself in Hell (luckily I wasn't wearing my t-shirt with the 15th century images of Hell on it at the time), how it is possible to come to different conclusions about the age of the universe and how all the current forms of life got to look like they do now, how Benny Hinn is an evil person who puts money before Jesus, and how I hadn't read the Bible since the day before. (I had been reading a scholarly work on the historicity of Jesus and some of the things that the "scholar" had written did not match my memory of the Bible, so my bedtime reading for the last few days has been the New Testament. King James version, of course.) We parted with an agreement about our local house of cash worship, Hillsong. None of this would have been very memorable except for how my dog reacted when they knocked on the front door. Cody went absolutely berserk, continually throwing himself at the door and seemingly wanting to get out and rip their throats out. This is a dog which is normally so friendly that when my daughter's friend patted him we accused her of killing him because his tail stopped wagging. I don't know if it is Baptists in particular or Christians or maybe even just religion in general, but I can't wait until the Mormons or Jehovah's Witnesses come around again. I might just accidentally let him out to see what happens. The number one subject in my email this week has been the death in Tijuana of Coretta Scott King, widow of Martin Luther King. Mrs King went to a quackery clinic to get treatment for ovarian cancer after real doctors had told her that there was little hope of a successful cure because of the advanced state of her disease. She received no treatment at the clinic and died four days after admission. The publicity following her death encouraged the Mexican authorities to close the clinic, and one of the reasons given was that it was being run by someone who had a history of fraud. It is a pity that it takes a high-profile death to trigger action but at least the Mexicans are prepared to do something sometimes, unlike authorities in other countries who seem powerless to act against these charlatans. I sometimes hear that only weak-minded or uneducated people could believe the claims of the more outrageous cancer "curers", but Mrs King was neither. She was instead a sick woman who was offered hope and desperately grabbed at the chance. I can understand how she felt, although I hope that if I were put in the same situation I would not react in the same way. Some supporters of quackery have asked me what is wrong with offering hope to someone who has been told by doctors to "go home and die". (No doctor ever says this, of course, but it is an inevitable part of the mantra when promoting quackery.) What is wrong is lying to people and stealing their money for useless treatments. My thoughts and sympathy go out to Mrs King's family. The world has lost another significant historical figure, and they don't seem to be making many of them any more. I finally got a chance to look at the CTV television show about Mr William P O'Neill of the Canadian Cancer Research Group. I highly recommend it to anyone who likes to see someone blatantly lie and then see the lies exposed. The film crew took a hidden camera into CCRG and caught Mr O'Neill saying such things as that he had never lost a patient with prostate cancer and that he had an 80% cure rate for some other cancers. When they finally got to interview him face-to-face they asked him about these claims and he simply denied ever saying these things. When they offered to show him the tape of the earlier visit he said that it had to be cleared by his lawyer first and then ran away (well, he didn't run but he terminated the interview). When they offered him copies of written statements from CCRG he claimed that they were forgeries and, just as he used to do when he wrote to me in non-GAL mode, said that they were the subject of current criminal and civil legal action. So predictable. So crooked. You can see the four parts of the show here. Professor Ian Frazer founded and leads the University of Queensland's Centre for Immunology and cancer research. For 20 years he has been researching the link between papilloma viruses and cancer, seeking ways to treat these viruses in order to reduce the incidence of cancer. Ian has now developed vaccines to prevent and to treat cervical cancer, which affects 500,000 women each year. A vaccine based on his research has shown in worldwide trials to prevent papilloma virus infection and reduce Pap smear abnormalities by 90%. It has the potential to virtually eradicate cervical cancer within a generation. Expected to be on the market within a year, this vaccine will revolutionise women's health across the globe. Ian embodies Australian know-how, determination and innovation. How is it that I seem to be the only person in the world who published the fatwa-inducing cartoons and then had nobody offering to kill me or burn down my embassies? I must try harder in the future. February 12 is the birthday of Charles Darwin. Last week I congratulated Professor Ian Frazer on being declared Australian of the Year. Reader Stephen Lambert has pointed out that I was not correct in stating that Professor Frazer had developed the first vaccine against cancer because it had been known for some years that the incidence of hepatocellular carinoma was highly correlated to Hepatitis B infection, and that vaccination against Hep B therefore reduced the rate of the cancer. I admit that what I wrote was a bit sloppy (and almost every press story about Ian Frazer made the same mistake), but I can see a justification for the claim. The link between the Hep B vaccine and lower rates of cancer was detected by working backwards - lower rates of cancer were observed in people who had not been infected with Hep B and the vaccine was the best way to prevent infection. In the case of human papilloma virus and cervical cancer the direct link between the virus and the cancer was known, so the vaccine was developed specifically to prevent the cancer. There must be something in the water in Australia (specifically in Queensland, it seems) that causes medical breakthroughs. There have been almost simultaneous announcements from the Mater Medical Research Institute and the Queensland Institute of Medical Research that very good progress is being made, to the point of conducting human trials, in the development of vaccines against prostate cancer and malaria respectively. If this sort of thing keeps up they might have to move the Nobel Prize award ceremony for medicine from Stockholm to Brisbane to save on air fares. Vaccines against three of the world's worst killer diseases would normally be seen as good news, or perhaps I should have said would be seen as good news by normal people. At the time of Professor Frazer's award a message was posted to one anti-vaccination liar mailing list with the subject "Can you catch cancer?" and the words "Oh dear - they really have this idea that there's a vaccine for everything, don't they?" The two later breakthroughs have been announced on the lists but it is still a bit early for the nonsense and vilification to start. I will be watching. Time is a bit tight again this weekend, so I have decided to reproduce something I did for the latest update to the Australian Skeptics site. It is just as relevant here as there. On May 5, 2005, the following story ran on the front page of the Australian Skeptics site. A warning to all parents. As mentioned on this site a couple of weeks ago, members of Australian Skeptics have uncovered the darker side of the so-called "alternative medicine" known as homeopathy. Attending the "Parents, Babies & Children's EXPO" in Sydney, we visited the official booth of The Australian Homoeopathic Association Inc (AHA). The two attendants both advised us, in no uncertain terms, that one could in fact vaccinate babies and children with homeopathy, in other words, water and sugar pills. We were also told that real vaccination is a major cause of autism and disease. As far as these representatives knew, we were simply people at the EXPO seeking information. How many parents and others were also told these lies? The Australian Homoeopathic Association Inc now have the opportunity to state clearly their position on vaccination. Either they agree with their EXPO representatives and publicise the fact that they promote homoeopathic vaccination, or they reject it and apologise for the false and misleading advice given in their name. This endangering of children is not new, and you can go here to see how short the quacks think the public's memory is. Following up on last week's story about homeopathy, Australian Skeptics issued a media release about this fraud and the danger it represents, particularly to children. Click on the picture below to see the full wording of the release. A homeopath has finally responded. As I was one of the people at the expo who was speaking to the homeopaths there, it has fallen on me to respond to the letter below. My responses are in italics. We have had a long time to look at the facts, and the rest of the world has had more than two hundred years since the invention of homeopathy. No evidence of the effectiveness of homeopathy has ever been demonstrated. This is not surprising, as homeopathy could only work if the laws of physics and chemistry were radically different from those observed by scientists. 1. The Australian Homeopathic Associaiton would never advise for the general public to avoid having their children vaccinated, but to inform themselves about the possible risks of all choices that parents have to make in this area. In writing your ill informed, hysterical piece you are actually making it harder for parents to make one of the most difficult decisions in the life of their new baby. The AHA might "never advise for the general public to avoid having their children vaccinated" but they told me that vaccines cause autism and other diseases. They also told me that they couldn't legally offer me homeopathic vaccines but it could be done under the counter. I agree that parents need to be informed of the risks, but the choice they have to make is quite easy. Do they want their children to be sick or well? The decision only becomes difficult when liars start filling their heads with incredible tales of the dangers of vaccines. Every woman who has a baby in a hospital (or where the baby is delivered by a responsible person) gets a copy of the federal Department of Health's booklet which describes all the diseases vaccinated against, the vaccine schedule and the possible adverse effects. You can see the booklet "Understanding Childhood Immunisation" here. Put another way, every woman who has a baby is informed. They may, of course, choose not to accept that information because they have been deceived by anti-vaccination liars. I am quite familiar with Dr Golden and his work. It is interesting to note that when he once suggested comparing the success rates of real vaccination with homeopathic magic he was criticised by several high-profile Australia anti-vaccination liars because they said that this approach might give some credibility to the notion that real vaccines work. When I did go to Google almost every page I was offered mentioning Dr Golden was on a rabid anti-vaccination liar site. If homeopaths are not opposed to vaccination why are they so closely linked to the people who certainly are opposed? I notice that Dr Golden was the founder of the Australasian College of Hahnemannian Homoeopathy. The name suggests that he is therefore a strong follower of Samuel Hahnemann. If I remember correctly, Hahnemann said that homeopathy was useful because it provided a method of providing the appropriate treatment for certain conditions. The concept of "proving" was to determine what treatments were appropriate by seeing what caused the symptoms of the relevant condition. If Hahnemann was correct then the concept of homeoprophylaxis is meaningless, as it cannot be possible to prove a treatment for a condition which is not yet showing any symptoms. 3. Being a skeptics association, I would have thought you guys would be better informed than that - why don't you actually research what you put on your website, rather than making sweeping statements based on someone's opinion who actually has no idea about the facts. We have been researching this form of medical magic for a long time. We are also always open to the presentation of facts. As soon as any homeopath is prepared to reliably demonstrate that they can tell the difference between any homeopathic "medicine" and pure water we will be very interested in getting them to show us the facts. You are welcome to come to our clinic and have a consulatation if you are actaully curious as to the truth about homeopathy and want to find out more...... isn't that what a skeptics associaion is all about? You can see some more about homeopathy here and here. Now that the holiday season is over and the court case has finished and my blood glucose levels seem to have somewhat stabilised and I have a regular exercise program and I don't need to see my tailor every week to make adjustments because my trousers keep falling down I might just be able to get back to updating this site every weekend as I am supposed to do. Even with all the disruption and irregularity, January still brought more visitors to the site than any previous month. I must be doing something right, and now I hope to be able to do it better. Thank you to everyone who keeps coming back, and, of course, to those who only come once and decide it's not for them. It would be a very dull world (and a very empty Google) if everybody liked the same thing. I received a reply from the homeopath I wrote to last week. I won't reproduce it here because it actually came to me in my capacity as Vice President and Web Wrangler of Australian Skeptics, but it rather predictably told me that I didn't know what I was talking about, and even accused me of emotive language. Me? Emotive? The lady also told me that she has "actually done a medical science degree and [has] an extensive education", a fact which makes me wonder about the standard of medical science education in Australia. Perhaps she did it somewhere else, maybe even by correspondence. She also told me that she hopes that "[my] life will one day find [me] with more meaning than putting all [my] energy towards trying to ruin the reputation of anything outside [my] understanding". She may be underestimating my understanding of homeopathy. Someone else who suspects my knowledge of homeopathy told me during the week that iodised salt is an example of homeopathy in action. When I asked if it would be a better preventive of thyroid problems if it contained only one millionth as much iodine he said that no homeopath claims that more dilute is more powerful. I then asked him to explain why homeopaths say that 30C is more potent than 30X and this person who claims expertise in homeopathy told me that of course this was so as 30X means a 1% dilution iterated 30 times and 30C means a repeated dilution of only10% so there must be more active ingredient left behind. I pointed out that this was slightly incorrect and even gave him a hint by asking him to think of what the Roman numerals "X" and "C" meant. He told me that being out by a few percent didn't matter. I have pointed out that a number with 30 zeroes in it is more than a few percentage points away from its square, but I have yet to receive an answer. If I were psychic I would predict that he will continue to evade the point and tell me that I don't understand the principles of homeopathy. Until last week there was an anomaly in the regulation of pharmaceutical products in Australia. All drugs except one were regulated by the Therapeutic Goods Administration. The one exception was the drug RU486 (mifepristone), used to terminate pregnancy, which could only be imported into Australia with the approval of the federal Minister for Health. This exception was made a few years ago as a payment to an independent Senator when his vote was required to pass a piece of legislation which was very dear to the government's heart. Those who do not see abortion as having any moral aspect at all and just a matter of individual choice and convenience. Those who either stated no position on abortion or who were morally against it, but recognised that as surgical abortion is legal in all parts of Australia there was no good reason to have the drug singled out from all other medications sold in the country. Those who were morally opposed to abortion and felt that they could not in good faith vote for the bill. Those who were really opposed to abortion but pretended to oppose the bill on other grounds (for example safety, as if it would be over-the counter instead of only available on prescription) and who made every attempt to divert or cripple the bill by amendment and obfuscation. A beautiful example of the last group was when an otherwise undistinguished backbench member of the government, Danna Vale, told a press conference that Australia was aborting itself into a Muslim state by having 100,000 abortions each year while the Muslims were breeding like rabbits. (It was enlightening to see one of the other group 4 politicians at the conference leap in and dissociate herself from this bigoted madness.) The facts are that nobody knows how many abortions are carried out in Australia each year (not all surgical procedures recorded in the 100,000 are deliberate terminations - many are done following miscarriage or to treat some other serious problem with pregnancies), Muslim families actually reproduce at slightly below the national average, and the majority of migrants do not declare themselves to be Muslims. To some it was bizarre to see racist and religious bigotry used as a tool in what was supposed to be a discussion about a health-related issue, but it was not surprising when you consider that the anti-abortion campaign is almost exclusively run by people who want to enforce their religious views on everyone else. Last week I lamented that despite my best efforts in publishing the most offensive cartoons ever created in the history of the world, no Muslims had attempted to kill me or cause me any even worse form of harm. Luckily, regular visitor Richard Scheffler knows just the people to help alleviate my despondency. Your recent lament regarding Islamic inattention to your gratuitous posting of disrespectful cartoons on your website has been brought to my attention. I am the world-wide marketing agent for a relatively new company, "Rent-A-Riot" ™. At Rent-A-Riot ™, we pride ourselves on providing high quality but reasonably priced riots tailored to YOUR special needs. All of our rioters are poorly groomed, unappealing, poorly educated and highly enthusiastic. We recruit our rioters mostly from college women's studies, sociology and political science departments although the occasional chemistry student may be asked to assist with special effects. We find these sorts of students to be less informed but more uninhibited and therefore more easily infuriated. You may specify the composition of the riot, all male, all female and mixed. Please note however, that there is a surcharge for babes-in-arms as most of our rioters are too immature to raise children. Costumes satirizing virtually any ethnic or religious group are in our property department along with the obligatory megaphones, flags-of-all-nations and effigies to be burned. We use only diesel fuel as we feel gasoline in the hands of our rioters is basically a bad idea. We use only natural fiber materials for our flags and effigies as synthetics melt as well as burn and tend to set inattentive rioters' hair and beards on fire. As a rule we do not create anarchist riots. They simply refuse to take direction. Also, for reasons that may be linked to I.Q. or the inability to read a map, they are never found far from someone else's demonstration. As a special service, unavailable elsewhere, we can provide ex-Marines and Soldiers to enter upon your property and either torch it or blow it up. Naturally, you'll be asked to provide a full release and neither you or any family members will be allowed to be on the property as it is vandalized, rendered uninhabitable or utterly destroyed - your choice. Symbolic book-burning is usually done by our staff members who are unnaturally attracted to fire but otherwise (mostly) normal. Signs and banners are available in language mildly provocative, really angry, militantly outrageous, obscene, sacrilegious, genuinely psychotic and totally appalling to any sentient being. While we usually recommend crudely drawn and poorly lettered signs, professional design is available if the riot is announced in advance and therefore not spontaneous. Sometimes we're asked if artificial demonstrations and riots will garner the media attention that marks the really successful public demonstration. Rest assured that our research shows that the media either don't care or can't tell the difference. We frequently find that pre-riot photo ops are all that's necessary to insure complete media coverage. We'd be delighted to meet with you prior to your next insult of some humorless and riot-prone group. If a riot develops spontaneously, you're in great shape. If not, we can step in immediately and raise your public profile. p.s. If you're interested in a LOT of media exposure, staff of our subsidiary, Lease-Some-Looters ™, would be delighted to meet with you. Depending on the neighborhood, this service may literally pay for itself. Murphy struck again at my computer (which is not so old that decrepitude should be either acceptable or expected) and I was left with no USB ports. As this meant that I couldn't update my Palm PDA (with all my diary and contact details on it from my customer relationship management system), I could neither update nor charge the battery in my iPod (essential, and maybe even mandatory, for travelling on public transport), I couldn't use the little disk-on-a-string thing that I need to carry stuff backwards and forwards when dealing with clients, my printer wouldn't print, my backup couldn't back up anything, and my uninterruptible power supply couldn't talk to the computer it was supposed to be protecting. Apart from that, everything was working correctly (even the USB mouse, because I found an adaptor in a drawer that let me plug it into the old-fashioned mouse port) but urgent action was still needed. The weird thing is that it wasn't a hardware problem but seemed to be something failing intermittently within Windows XP. (Note to fanatics: emails about Linux and Macs will be deleted immediately upon receipt.) It's all fixed now and the smooth tones of Gerry Mulligan's baritone saxophone are coming out of the iPod, so it's time to get back to work. My plan this week was to write three reviews of books about religion, but only one is actually here - the others will come over the next few weeks. The three authors all address the same problem - the relevance of religion to today's world. The differences are the attitudes and backgrounds of the authors. Sam Harris, author of The End of Faith: Religion, Terror and the Future of Reason, is a philosopher. His views on religion and its worth and dangers would make Richard Dawkins look like some sort of wimp, and are essentially that religion has to be abandoned if civilisation is to survive. (He undoes some of his argument by changing tack and offering what appears to be support for eastern mysticism, including meditating on mountain tops it seems. This aberration can be ignored.) His main point is that all religions are mutually incompatible, regardless of what adherents say about ecumenism and tolerance, because each preaches that it is the only way to paradise and all others are therefore heretical by definition. He spends a lot of words looking at Islam, but Christianity and to a lesser extent Judaism get a serve as well. Harris does not like religion at all. The second book is The Sins of Scripture by Bishop John Shelby Spong. Spong has long been somewhat of a heretic, and in this book he points out the absurdities and anachronisms in the Bible which he feels have to be abandoned if Christianity is to have any relevance in the twenty-first century. He is still committed to Christianity and still a believer in Jesus and his good words, and he would like those good words to be all that is left of the Bible. His views don't seem far from those of tolerant atheists, so I am not sure if there would be any Christianity left if his dreams came true. You can read the review of the book here. The last book is God: The Interview by Terry Lane. The author was a radio announcer who retired last year from the Australian Broadcasting Corporation in Melbourne. He trained as a minister of religion but has gradually moved towards atheism over a period of time. He is a very good interviewer, and, as the title suggests, this book is how he would like to see a radio interview with God proceed. This is the best book of the three in my opinion, because it lacks the savagery shown in the other two but still addresses the absurdities that any religious believer is required to accept. Sam Harris suffers from the same one-eyed intensity that allows believers to dismiss Richard Dawkins, and Bishop Spong is walking that very thin intellectual tightrope which allows for selective acceptance of dogma. Terry Lane uses humour and ridicule to highlight what is humorous and ridiculous, and he makes the point of the pointlessness of religious belief much better. Readers of Harris might keep saying "That's outrageous", Spong's readers might be saying "That is a pretty stupid thing to believe", but Lane's readers will be saying "That's right! ".